He can be found in the revamped Cumbre de Roca Negra Superior 5-man dungeon for Warlords of Draenor. He is a rare elite which will not appear every time you run the instance. He drops a Engendro de lantícora battle pet. I assume it is a 100% drop rate but you will have to roll against 4 other people. Updated 7/13/15 update to information. Updated this 2/8/15 to reflect pet drop rates. Updated this 12/17/14 to reflect Live Changes. This rare elite is found in the Rookery in the (100) 5-Man Heroic Dungeon - Upper Blackrock Spire. He is located just to the right of the second boss, Kyrak. 2. He hits really hard (was 210-290k per melee attack). His attacks still hit fairly hard, but they aren't 1-shotting tanks anymore. He kind of tickles now; any tank with BRF LFR gear can easily tank him. 3. We killed him on our 4th or 5th attempt by having our monk tank literally kite around like a crazy person. Kiting is still a viable method if he is doing too much damage to your party. We were able to kill him in one attempt in Live though, and he actually got pulled during Kyrak's encounter. 4. Loot: In beta he didn't drop anything - they had yet to attach the pet to him. However, on live today he dropped X2Engendro de lantícora in a party of 5 on personal loot. * Edit: Adding in info about drop rates- according to fellow players, this guy is more rare than we had anticipated. People have been estimating 50+ runs to even see him, and a lot of folks are not even seeing a pet on drop. I went looking for the drop rate, and found some useful information posted by user Nechin. According to his calculations the 100% drop rate on the pet isn't a true 100% - only if the loot is put on Need Before Greed. The Personal loot system works in a possible disadvantage for people seeking to get this pet because it cuts the divides the 100% chance into 20% shares equally among players. He can be found near Kyrak, who has taken up residence in the old Rookery, just after the first boss' room in Cumbre de Roca Negra Superior, which has been revamped for Warlords. The pet he drops, Engendro de lantícora, teaches you Engendro de lantícora, a battle pet that looks like Chimaeron. Killed him today on heroic. He dropped 1 pet which got rolled out trough the personal loot system. I did this and 2 were dropped for the group. The 100% drop rate is deceptive. If you switch to need before greed this is true but only 1 item will drop. If you stay with personal loot this is interpreted as 20% chance for each person independently. There is a good chance on any particular run you will not see it drop using personal loot. If you do not have a hc geared tank and a good healer, i would advise NOT to pull this together with the boss (like I did yesterday by mistake) or only at the very end of the combat, when lanticore enrages he hits really hard, like a challenge mode boss, and his enrage can't be removed with soothe or tranq shot. He does not use any spells though, so with a bear or a monk tank, (if he can keep up the dodge buff,) killing him should be easy. Killed him today, December 7th. Loot was personal, and everyone in the group got the pet. Perhaps previous posts unfortunately were met with a glitch? Encountered this rare today. I can confirm that the above fact is correct. We had personal loot the entire instance and only 2 out of 5 in the group were able to loot the pet. I was lucky to loot it. The pet looks like the boss inside Blackwing Descent - Chimaeron. There seems to a bug with this pet at the moment. When you are using Galleta de mascota mágica you are throwing the cookie like piece into the air. As if the pet were 10 times larger than it looks. When I target him, the name appars at the top of my Town Hall in the Garrison. Saw this guy doing Leeroy, then everyone left. I was able to solo as a warlock, used a portal on the balcony above. He didn't drop anything. His spawn location is the far right corner of the room just to the right of the boss (second instance boss) and to the right of Leeroy's spot on the floor. One pet is guaranteed provided group loot is selected. 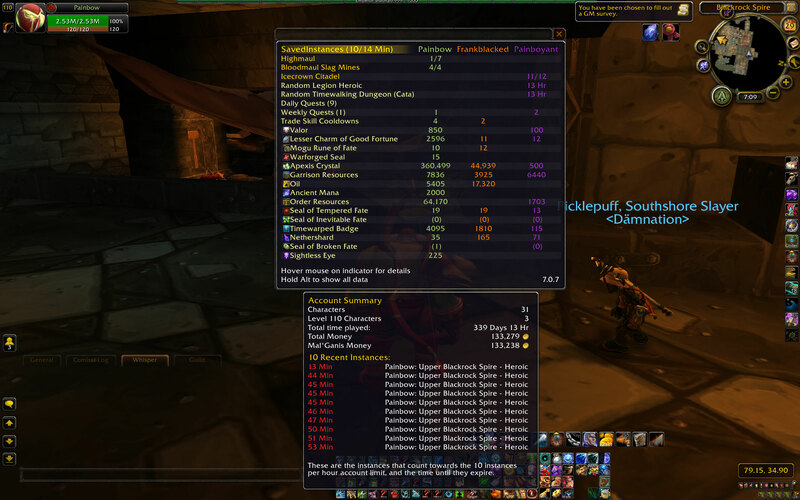 When LFG random heroic dungeon run with personal loot, could be dropped with certain % in amount of 0-5, i.e. could be dropped for all group members, several, one or none. Can anyone confirm whether this mob spawns only after first boss is killed, or can he be checked at the entrance? someone told me they removed the lanticore they are lying right? Does anyone know if the boss can spawn in mythic mode as well? The Lanticore is still in the game. Saw him for the first time today. Drop chance is not 100%....no one got a pet. maybe it says 100% drop because the only time you can loot this is when it has the pet? Hey guys, today this pet dropped for me when I was doing a HC dungeon. I was the only one to get it though. This sure is going to be a new farm dungeon come Legion, since the prices for the pet are far too high for me to buy it.... possible the price may even drop in Legion as more ppl will be able to farm the pet than now. It should be soloable with Level 110 and some decent gear just like MoP hero dungeons are now in WoD. If this drops a pet how come more groups doesn't do it? I've been in UBRS several times but never seen this boss. i didnt even know this was a thing. been soloing wod heroics now that im 110 and was making another attempt at leeroy since i messed it up yesterday. saw the lanticore on my way through and thought.. that wasnt there before was it? apparently not. it did drop the pet for me though. Since I can't find confirmation or any information anywhere online, I'm posting my experience here. I just entered and reset 10 dungeons per hour on three separate accounts for about 5 hours straight. All three characters were over level 100 and had it set to heroic. I went in, hit a macro I made for /tar The Lanticore and left if he wasn't targetable. You are able from the entrance of UBRS to target every single boss in the dungeon, so I assume that if The Lanticore were to spawn, you would be able to target him from the moment you step in. Nobody has confirmed whether or not you can target him when you just walk into the dungeon without a group. I'm not sure it's possible. I'm not sure he spawns in anything but the random WoD queue because I have not seen any screenshot or any evidence of it happening, and I just tried over 130 UBRS resets today so far and nothing at all. I'll keep trying and report back here, but at this point I'm very skeptical. I can confirm from personal experience that, while soloing UBRS heroic at lvl 110 your default loot setting will be 'personal' so even if you do manage to find the Lanticore up, you only have a 20% chance to get the pet to drop. Good luck to anyone attempting this, I know I'm looking forward to getting him to spawn a second time for another shot.. Anyone seen this guy in 7.2.5 or 7.3.0? I've been farming for three weeks, with three chars. Finally on week four the Lanticore spawned with the first char I tried with this week. I can confirm that when he does spawn he is just to the right of Kyrak as you look at him, on the other side of pillar. He was there when I entered the room, before Kyrak was killed. This is the first time I saw him and he did drop the Engendro de lantícora. I believe that if you are soloing this dungeon post-WoD the drop rate is 100%, when he finally spawns. Good luck. Anyone know if /tar Lanticore works when you enter the instance? In which case you could run out and reset until it spawns? Does he also appear on mythic difficulty? You HAVE TO kill the 2nd boss in the dungeon (Kyrak) for Lanticore to spawn. I wasted about 20 attempts by just going to Kyrak and leaving the instance after not seeing him there, because almost all of the comments and tips on the internet, tell you that it's enough to kill the first boss. This is false. If my calculations are right I should have over 60 Kyrak kills at the moment, haven't seen The Lanticore once. edit: I started believing that they remove The Lanticore from the game but today finally after close to 100 runs (split on many characters I parked infront of UBRS) he spawned and dropped the pet. Este PNJ se puede encontrar en Cumbre de Roca Negra Superior.